This amazing display of 3D graphical animation was built by a company called Dreamoc. 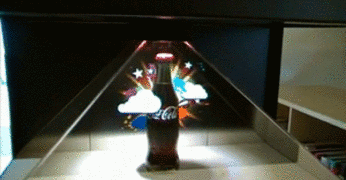 A pyramid-like surface that's only viewable by 200 degrees allows Dreamoc to combine breathtaking animation with a real life product, like a Coca Cola bottle. It looks like one of those creative Coke commercials you see in movie theaters during previews, you know the ones I'm talking about. As visually astounding as this hologram is, I wonder how beneficial this type of technology will be in the future? Are there any practical functions that holograms can be used for? Continue reading to see Dreamoc's 3D hologram. Imagine using 3D technology like this to enhance the physical presence of a business as well as visual advertisements. If you walked by a bar and saw a beer surrounded by explosions, helicopters, and fireworks I bet you'd be intrigued. Unfortunately, there has been no word on whether this will be available to consumers any time soon. Lenovo Unveils "World's Smallest Desktop PC"
Fantastic work ! Congratulations, can really see this being exploited on POS stands. Have got no idea what the technology entails in terms of equipment & how difficult it is to set up - but would like to know more about this.